Your character is hardy despite your putrid state, aware of your surroundings through endless years, and driven by loss and frustration. Age: Many living dead eventually lose track of their age, but that’s not always the case. And even then, their age is typically equal to the year they “died” before coming Living Dead. Alignment: Hailing from all walks of life (or un-life), the Living Dead tend to be a wide variety of alignments. But, do to their distance from mainstream civilization, chaotic-alignments are the most common. Darkvision: Your curse of undeath has left the gift of seeing in the darkness. You can see dim light within 60 feet of you as if it were bright light, and in darkness as if it were dim light. You cannot discern color in darkness. Languages: You speak Common and one non-exotic/non-secret language of choice. Undead Resistance: You do not need to eat, drink, or breath; thus you do not starve or suffocate. Furthermore, you are immune to disease and poison. You gain resistance to necrotic damage. Once per short rest as an action, you can spend a hit die by “feasting” upon (the flesh, soul or whatever the character needs from) a recently slain victim. Meditative Blankness: Instead of sleeping during a full rest, you meditate in a trance-like state to empower the necrotic energies that flow through you. You do not dream and are somewhat aware of your surroundings during the trance. You can pass off as a dead body while in this state. Curse of the Undead: You are also weak against Radiant damage. If you fail to feast upon a recently slain creature within 24 hours, you gain disadvantage on all attack, attribute check, and saving rolls until you do. Due to your grotesque form and rotten stench, you gain disadvantage on Charisma checks to socialize or interact with others, except for Intimidate. A proper disguise thwarts the disadvantage until discovered. You are detectable as undead via Detect Good and Evil. Pretending to be a dead body (such as during a rest period) does not warrant this disadvantage. 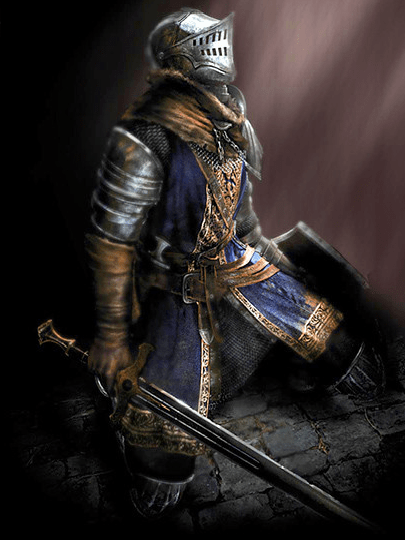 NOTICE: The art piece is owned by From Software for the video game, “Dark Souls”. This race and its lore are the creations of Doctor Necrotic. Original rules belong to Wizards of the Coast and Hasbro. If used, please give credit where due. All rights belong to their respective owners. ← We’ll Meet Again, Don’t Where, Don’t Know When! Man, this is just amazing! You nailed all the aspects of what a “living dead” is in my imagination, incuding the obligation to “feast”! Glad you enjoyed my undead race. Also, that quest idea sounds awesome! Unfortunately, prestige classes don’t really exist in 5th Edition (in the traditional sense). The best compromise is taking sub-classes that carry a more “undead” feel to them, like the Death Domain cleric, Oathbreaker anti paladin, and Necromancer Wizard. That said, I might make some more dark antihero archetypes in the future (such as my Fallen Druid). As for Nazgul, making a Shade monster template might work, perhaps allowing worthy players take this later in their careers as well.